Experience, poise, and presentation brought home the winning entry in this year’s CIRT-ACE National Design Competition. In a fiercely competitive and spirited final round of competition among Affiliates that had all sent teams to the national finals before, the mentor team from Frederick, Maryland came out on top. The presentation phase for the three national finalists occurred on the afternoon of Tuesday, May 6th at the CIRT Spring Conference in Washington, D.C. While all three teams did an excellent job in presenting their entries, only one could claim top honors and that went to: ACE of Frederick, Maryland for their “Universal Design Home Challenge/Aging in Place” entry. In addition to our winner, Second Place went to ACE San Francisco Bay Area, CA/Peninsula One Team for their “Library Relevance Challenge/Varsity Library” entry; and Third Place went to ACE Mentor Program of Miami/Dade County: Miami Coral Park Senior H.S. Team for their “Defined by Architecture Challenge/Marine Stadium” entry. The winning team received a $5,000 prize for their Affiliate, but more importantly bragging rights for a year as the top mentor team in the country. Second and third place received $3,000 and $2,000 prizes respectively for their Affiliates as well. 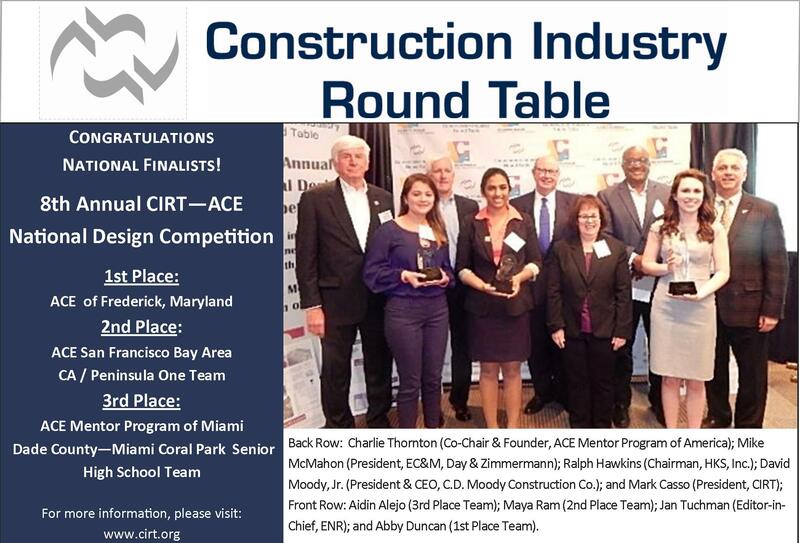 A record 44 entries (representing 21 Affiliates/Chapters) from across the country competed for top honors in the Eighth Annual CIRT-ACE Design Competition with only three garnering the coveted right to be named a national finalist. The final round presentations were judged by a distinguished panel of CIRT members and others, with chief judge Charles (“Charlie”) Thornton (Co-Chair and Founder, ACE Mentor Program of America), presiding over four others including: Mike McMahon (President, EC&M, Day & Zimmermann); C. David Moody, Jr. (President & CEO, C.D. Moody Construction Co.); Ralph Hawkins (Chairman & CEO, HKS, Inc.); and Janice L. Tuchman (Editor-in-Chief, Engineering News-Record ). The judges all noted: not only were all of the projects well done, but what an extraordinary job each of the student presenters had done in advocating for their entries, which made the final choice all that more difficult. CIRT looks forward to the 2015 competition and next year’s final presentations.